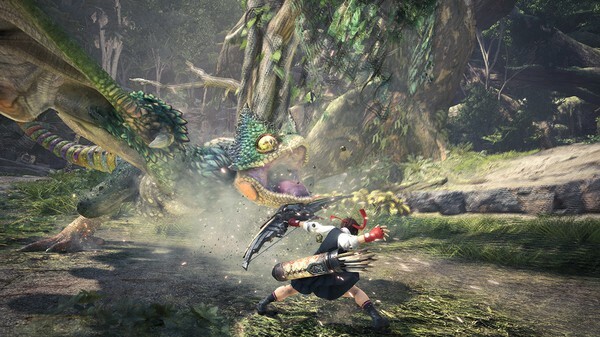 Monster Hunter: World, Capcom’s shiny new game, has been out for a few days now. The Japan based publisher has just announced that it will be introducing iconic characters from Street Fighter V, Ryu, and Sakura, into Monster Hunter: World. Players will be able to acquire armor sets in Worlds that they can reskin in order to look like the two fighters from the Street Fighter franchise. The announcement, via the Capcom Unity blog, also mentioned that PS4 players that have a Street Fighter V save file on their system, will be able to access Ryu ahead of its release to everyone else. “In just a few weeks, we’ll be featuring the quest to get Ryu’s set as an exclusive early opportunity to PS4 players that also have a save data file from Street Fighter V (including Street Fighter V: Arcade Edition),” Capcom explained in their blog. Specifically, players with the Street Fighter V save data will be able to receive a quest in Worlds that will be called ‘Down the Dark, Muddy Path.’ This quest will allow players to get SFV Tickets as a special reward item, upon completion of the quest. Once the player has the SFV Tickets, along with other necessary materials, all they have to do is head to the Smithy and he’ll craft you a special Ryu armor set. Who’s ready to hunt down some monsters as Ryu or Sakura? How is your Monster Hunter: World experience? Watch out for our upcoming review of the game soon!